A Puppy Dog Pals Party must have! 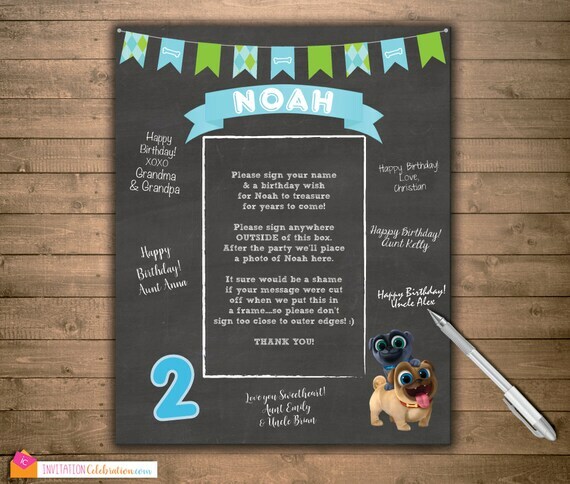 Perfect addition to your puppy dog party for guests to sign a birthday wish. Afterwards just frame and display in child's room or memory book. This is something they will treasure for years to come. White marker (chalkboard markers) or white/silver gel pen for guests to sign with can be found for purchase on Etsy or in any craft store. This is a digital/printable file that will be emailed to you for you to print at the location of your choice (at home, local or online print shop, office supply store, etc). This is designed to be printed on simple PLAIN, WHITE CARDSTOCK. I prefer 100 or 110 lb weight card stock but anything over 80 lb should work well. Your file will be e-mailed to you within 2 days after sale (and after acceptable photo is provided - if that option was chosen).